A commission of inquiry investigating the sudden flooding and sinking of the INS ‘Sindhurakshak’ submarine off Mumbai port, killing all sailors on board, concluded that the incident on the night of August 13-14, 2013 occurred while the ammunition was being loaded. 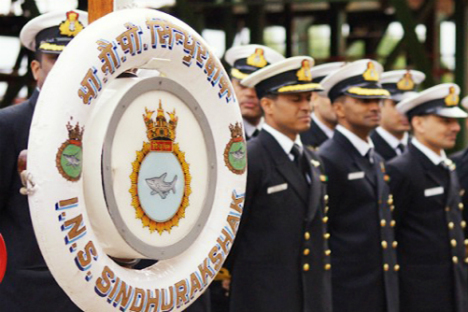 The cause of the flooding that occurred in the INS Sindhurakshak, a diesel-electric submarine of the Indian Navy, was an explosion while arming of torpedoes during the loading of ammunition. The submarine sank off the Port of Mumbai on the night of August 13-14. In a written reply to the Rajya Sabha (upper house of Parliament) India’s Defence Minister Manohar Parrikar said the inquiry commission appointed by the government to investigate the sinking of the INS Sindhurakshak had concluded that ammunition had detonated, causing the sudden flooding. He did not comment on earlier reports that there had been negligence. “Since none of the crew members survived, it is impossible to claim that this incident was caused by a specific person or due to negligence,” Parrikar said. At the time of the explosion, 18 people were on board the submarine, all of whom died in the Indian navy’s worst ever peace-time disaster. "Lessons learnt from the reports of Board's of Inquiry (BoI) are implemented appropriately. Corrective steps have been taken by Naval Headquarters with extensive checks on weapon related safety systems and audit of Standard Operating Procedures on all operational naval units," the minister informed parliament. “The commission concluded that the incident on board the Sindhurakshak submarine on the night of August 13-14, 2013 occurred during the loading of ammunition,” said Tass, quoting from an official report released by the Indian Defence Ministry. The ‘Sindhurakshak’ was built for the Indian Navy in 1997 at the Admiralty Shipyards in St. Petersburg. It was subsequently modernized in the Zvezdochka (Star) Ship Repair Centre in Severodvinsk. A modern Club-S missile complex was installed on the submarine, as well as about a dozen other systems of Indian and foreign origin, including the Ushus sonar system, and the Porpoise radar station. Referring to the incident with the INS ‘Sindhuratna’, another diesel-electric submarine which ran aground off the Mumbai port on January 17, 2014, Parrikar said the fault lay with the ground services, which improperly calculated the time of high tide. “Administrative measures have been taken against the officer that was responsible for this incident,” said the head of the Indian Defence Ministry. According to Parrikar, the investigation was also completed into the February 26 incident that on caused the Sindhughosh diesel-electric submarine to be filled with toxic smoke, and led to the deaths of two sailors. The ‘Sindhuratna’ and ‘Sindhughosh’ were also built in Russia, and modernized in the Zvezdochka Ship Repair Center.